The New England Patriots made a huge stand at the goal on Sunday night in Super Bowl XLIX, which culminated in the interception by Malcolm Butler at the goal line with just 26 seconds left in the game. With the win, New England proves they are more clutch, smarter and just plain better than the 31 other NFL teams. In a wild contest that had just about everything, New England rallied from a deficit of 10 points with less than eight minutes to play to defeat Seattle 28-24. Bill Belichick the New England head coach said he loved the players and was very proud of each of them. Tom Brady the New England quarterback had four touchdown passes and 328 yards. He won the MVP award and moved into plateaus occupied by Terry Bradshaw and Joe Montana. The last 66 seconds of the game were easily the wildest 1 minute and 6 seconds of any of the previous 48 Super Bowls. Jermain Kearse came down with an acrobatic circus catch on the 5-yard line with 74 seconds left in regulation. How the Seahawks lost the game from that point on will be the subject of debate for many years. Following a rush by Marshawn Lynch to New England’s one-yard line, Seattle was second and goal with just 26 ticks left on the clock and one time out. 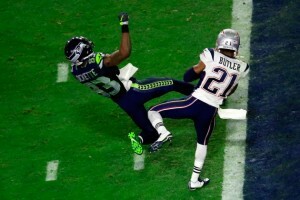 Coach Pete Carroll made an incredible play call, sending in a slant in traffic that was intercepted by Butler when he stepped in the path of Ricardo Lockette and beat him to the ball. Butler made a tremendous play but it was the strangest play called in Super Bowl history. Seattle has one of the best power backs in the NFL in Lynch. The Seahawks could have run it one or at least two times more and the game would have ended with Seattle being back to back NFL Champions. Carroll said following the game that the matchup was not correct to run so they passed it. The game was close from the beginning with New England scoring first then Seattle tying. New England scored late in the first half and Seattle came right back to tie the game at 14-14 at the half. Seattle dominated the third quarter and took a 10-point lead into the fourth quarter, before Brady led the Patriots to two touchdowns in the fourth and Butler saved the game on the goal line.